This photograph was taken high in the Bolivian Altiplano, after two days sat in a jeep crossing desert and mountains and a blinding sea of salt. The rocks are lifeless, the salt deadly, and the oxygen at 3,600m is lung-achingly limited, but as we weary travellers sat outside our lodging, we were suddenly approached by a group of curious Bolivian children. We were surrounded by life for the first time in days. I love the way this little boy’s feet are barely touching the ground; he is floating on the roof of South America. The vivid colours are a joyful contrast to the bleached salt and dusty moonscape; we are finally returning from the otherworldly scenes of the Altiplano to the warm, colourful world we had left behind two days earlier, made more vibrant by the evening sunlight. The boy is dancing in the sunbeams, and we can tell that he is smiling. His lightness and enjoyment mask the physical trials of his homeland – several travellers tried to run around with the children but soon collapsed, gasping, because of the altitude. But this little Boliviano was in his element, the perfect product of his environment. 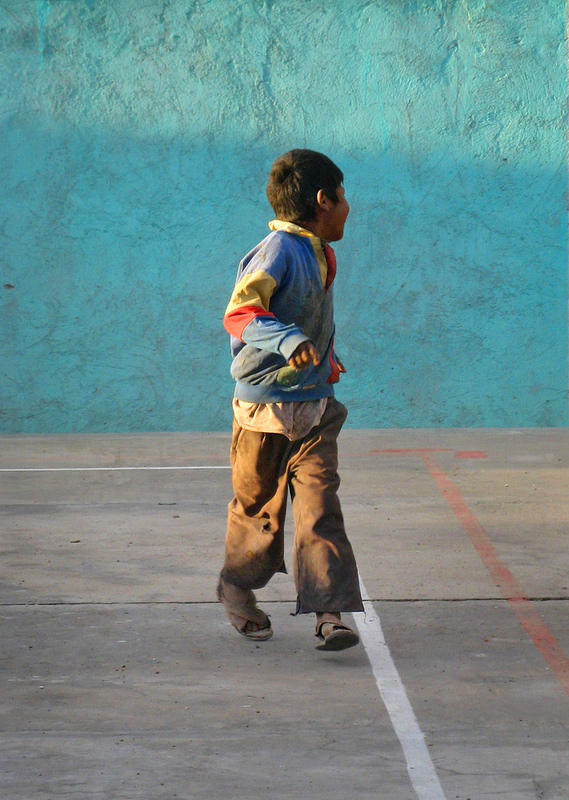 Tags: Bolivia, colour, community, photo Friday, photography, Uyuni. Bookmark the permalink. “The perfect product of his environment”. Thank you for sharing this photo.